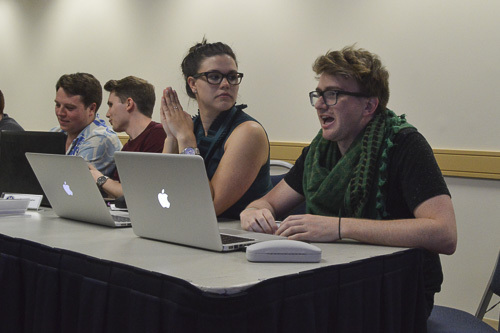 The Student Association Senate passed a budget Monday night to fund student organizations through next academic year. The bill was approved by the senate, after relatively little debate, by a vote of 27 to 1. The budget distributes about $980,000 of the SA’s approximately $1.3 million budget to student groups across campus. More than 110 groups saw a decrease in initial funding, but Paden Gallagher, the chair of the finance committee, said drop was because more funding was set aside for co-sponsorships given throughout the year. The finance committee will have about $344,000 to give out to student organizations during next academic year, about $160,00 more than was set aside this year. Gallagher said many academic-focused student organizations received last funding in this year’s budget compared to last year. He added that arts groups also initially received a significant budget cut, but the appeals process, which gave out $65,000 to 50 student organizations, which helped to lessen the gap. SA President Andie Dowd said she will sign the budget, avoiding the contentious fight that occurred last year after then-SA president Nick Gumas vetoed the initial budget because he said it failed to fund too many student organizations. After a weeks-long battle, the senate overrode Gumas’ veto in a special session and Dowd signed the bill. At the final meeting of the current term, senators also passed a resolution calling for the University to allow student staff members to attend President Steven Knapp’s office hours. Sen. Brandon Brown, GSEHD-G, said that as a staff member he is currently not allowed to meet with Knapp despite the fact that he is also a graduate student. “All graduate students who are also staff double down and work here and should have same rights as all other students,” Brown said. The senate also passed a resolution commending senate chief of staff John Lindsay for his work with the SA throughout the past academic year.